Social media is a crucial source of traffic, reputation, and conversions for most websites. These platforms give you a chance to present your business in the best light and attract more potential customers to the main page. You get the picture: a strong social media marketing strategy is an inevitable aspect of your promotional campaign. Inexperienced website owners think they only need to create profiles on few social media networks and start posting some links to their websites. Unfortunately, that doesn’t work. Successful promotion needs a strategic approach, based on the right practices and tools. Did someone mention tools? We have a list of 8 social media tools you can use to boost the success of your website. When you’re managing several social media profiles at a time, it’s not easy to respond to all comments and develop an influential presence on different networks. That’s why you need Post Planner – a tool that lets you schedule posts on Twitter, Facebook, and Pinterest. The post queue feature is really useful since it allows you to add status updates and set the time for posting. It will take less than two hours for you to set the plan the posts for the entire day, and the tool will automatically maintain your activity on social media. The only problem is – it can’t respond to comments for you. Of course, you’ll need to check your profiles from time to time to see how the audience receives your updates, but that won’t take too much time. Post Planner is not just a scheduling tool; it’s also a social media engagement tool. It enables you to target a specific audience when scheduling your posts. With this app, you will discover content that skyrockets engagement, drives more traffic to your website, and boosts the reach of your updates. When you post the best content from the web in addition to the updates that promote your website, you will achieve higher levels of engagement on social media. This online tool lets you attach videos, photos, and media experience to tweets. We all know how fun short tweets are. Some people have the talent to nail the right argument in the right situation. Unfortunately, that’s not an easy thing to do when you’re using your profile for marketing purposes. Of course, you can tweet on popular hashtags, but that will bring more traffic to your website only when you establish a powerful brand. Until then, you need to use Twitter in a marketing-driven way. If short tweets don’t allow you to present anything more than a title and a link where your followers can find the posts, then you need to start a different, visually-appealing format. You can create four types of cards with the tool: summary card (it contains a Twitter account attribution, title, description, and thumbnail), summary card with large image, app card, and player card (this is the one you can use to include video/audio/media to the tweets). 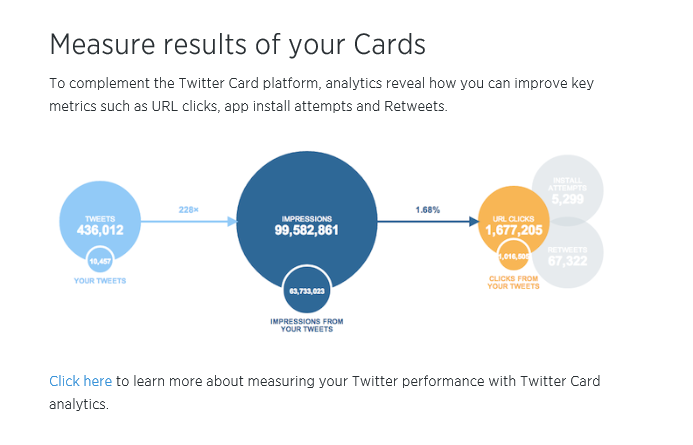 The best thing about Twitter Cards is that you can measure their reach. Thanks to the metrics like retweets, URL clicks, and app install attempts, you’ll be able to analyze the success of your marketing campaign and make the needed improvements. This is a search engine that helps you reveal the reputation of your brand among Internet users. Website owners and marketers can also use it to discover relevant topics that attract the interest of their audience. 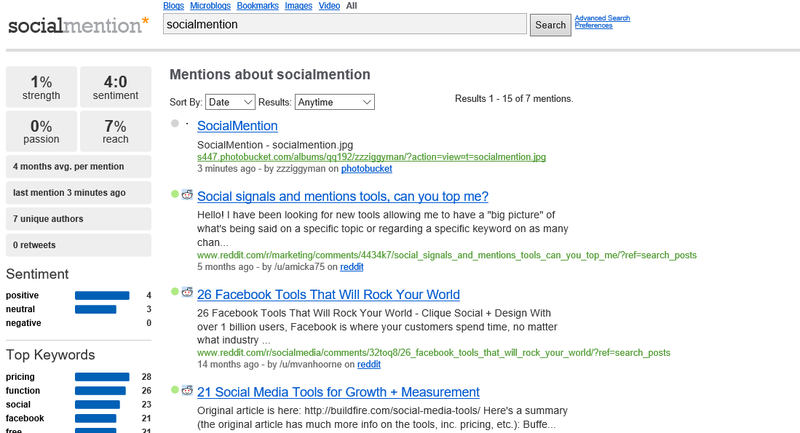 When you enter a keyword in the search bar, Social Mention will give you a list of user-generated content. This is the most important reason to use the tool: you can find out what people are talking about your brand, website, or you as an owner. Just enter the needed search phrase and you’ll see how your brand is being discussed in social media. The mentions will be listed with a link, so you’ll visit those sites directly to see the context in which your brand is being mentioned. The only problem with the tool is that it might launch a huge list with many old results among the new mentions, so it will take some effort for you to filter the list and discover the results that are relevant at the moment. If you don’t like what you see through the reports you get with Social Mention, the problem may be in the content you produce. In order to start launching high-quality content that will get great mention across the Internet, you can start going through essay writing review sites, which will help you find a top-notch writing and editing service that will deliver the content you need. Here is another tool that lets you know what your audience thinks about your brand. Thanks to Viralheat, you can monitor relevant conversations across social media, and you’ll be able to use those insights for the growth of your business. The tool doesn’t filter out spam, so you might have to deal with some useless results if your brand is very popular. However, Viralheat does scan the Internet to discover all mentions, so it’s definitely a nice tool that lets you measure your reach and reputation. There is no free version of this tool, but you can ask for a 30-minute live web demo if you want to learn how it can help you monitor, manage, and measure the social activities related to your business. When you start using the tool, Viralheat will search for the keywords in any language. That fact may seem overwhelming, but it’s really useful when you want to know how your website is perceived on an international level. The tool won’t translate the results; it will only search for the mentions and present a language report. When you have multiple social media profiles to manage, it’s easy to waste your days browsing through the feeds, posting updates, and responding to comments. With Hootsuite, social media profile maintenance becomes easy, since the tool allows you to manage up to 100 profiles from a single feed. The dashboard is more than a collection of posts from different social media platforms. It allows you to select a specific profile, post updates or schedule them for later publication, and compose messages. Hootsuite is not only intended for maintaining social media profiles; it’s also an analytical tool that offers reports in graphical form. Unfortunately, the free plan is very plain, so you’ll need to pay for most of the cool extras. Although it might take you a little over budget if you want to use its entire potential, it’s definitely something worth trying. You can keep posting links and updates to your social media profiles, but those activities won’t lead to impressive results if you don’t get some engagement from influencers. We all have few influencers in our list of friends: we always read what they have to say, we like their posts, and we can’t wait to see what they recommend. You need to target those influencers and use them as a really effective marketing channel. If, for example, you’ve published a piece focused on the Y-generation, an influencer from that category can help you promote it much better. 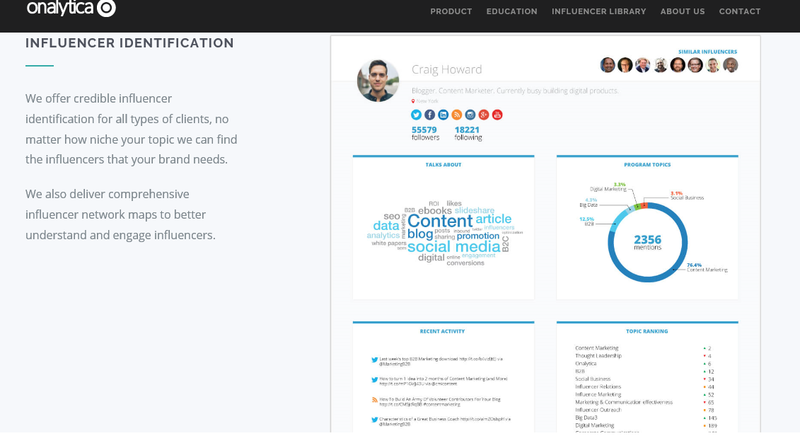 Onalytica is a great tool that helps you identify the social media influencers in your niche. You only need to upload a piece of content or simply enter a link to a page of your website. Then, the algorithm will launch a list of 25 influencers whose interests your content meets. You’ll be able to monitor the activity of these social media users and understand their style before you try to reach them. Onalytica also provides you with data and insights that help you understand important online discussions. Let’s be honest: Twitter might be the coolest social media network, but it can be a real mess when you try using it for your website’s promotion. It’s not that easy to start a profile, start posting tweets with relevant hashtags and build your audience in no time. With Narrow, you can build a targeted following base on Twitter by interacting with users who might be interested in your offer. You enter hashtags or keywords, and you allow Narrow to identify the target audience and start building your following. The research tool also helps you understand your audience. The best part about Narrow is that it’s fully automated. It won’t present you with a list of potential followers and leave the rest to you; it will connect and engage with relevant users and give you some analytics to understand those activities. The Pro and Business plans are a bit pricey ($49 and $99 per month respectively), but you don’t have to use Narrow for a long time. You just need it to help you build the initial base of followers, and you can take over from there. If you want links to your website to be present all over social media, then you have to make it easy for your visitors to share the pages. 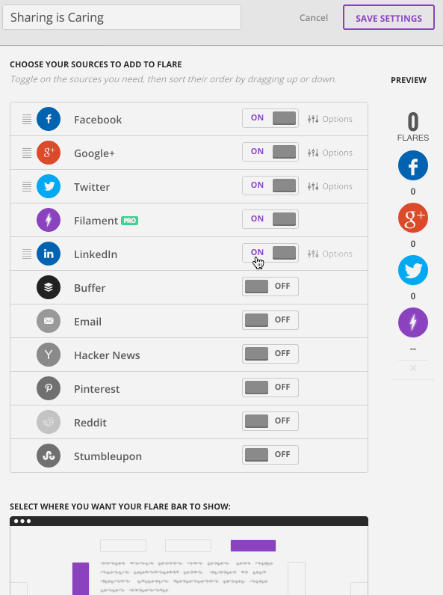 Flare is a great sharing plugin for WordPress. It enables your visitors to share your content via social media with a single click, but it does more: it gives you reports on the total sharing activity across all networks. Thanks to Flare, you’ll identify the type of content that gets attention from your audience. Maybe you’ll notice that infographics are more popular than traditional posts, so you’ll focus your future activities on crafting the type of content your audience prefers. It’s really easy to add the Flare bar to your website and choose the interface that fits flawlessly into your design. The above-listed social media tools allow you to promote your website in a simple but effective manner. All of them are focused on different activities, so you can test them to discover how they fit into your marketing campaign. When you start using the right tools, it will be easier for you to attract a great deal of audience, and you’ll finally be able to handle multiple social media profiles. Stephanie Norman from Sydney has been a contributing blogger and professional writer for 4 years already. She writes business, creative, and academic content as a freelancer covering content marketing, blogging, and writing issues. You can follow her at Facebook and Google+. It’s a pretty decent post, this is Zameer from Recurpost. We are Recur Post just like other social media tools PostPlanner and Hootsuite. We offer a free plan which lets you connect up to 3 social profiles. However, the best thing is we let you automatically reuse your old content so you never have to worry about running out of posts without realizing it, or having to constantly update your schedule. We would love to hear if we can get your views on RecurPost. Thanks so much for the post. I found this to be really helpful. Checking out Onalytica and Flare now. I also really like Buffer. Haven’t used HootSuite but Buffer is very user-friendly with an easy interface. Makes scheduling really easy and is free to get started. SocialQuant is another good tool to check out if you want to build a Twitter following. Sounds like it may have slightly less features than Narrow but it’s also a little less expensive if you’re just starting out. Buffer is one of my faves at the moment. Do you rate it? Hi Rosa, this is the second time today I’ve been seeing good reviews on Hootsuite. Your blog post has given me the motivation to go check it out. Thanks for the awesome content! Social content sharing is a must if content marketers desire to see a positively drastic influence in feedback and shares from their hard published works. It’s virtually impossible for bloggers and content marketers to manually login to different social networks and post links to new posts. And most importantly, they have to keep site content updated daily or every other day in order to benefit from improved SEO and establishing steady streams of long term traffic from search engines and social platforms.